Turn up the fun on your camping or backpacking trip with MSRG’s collection of cool stuff and games. You’ll be the campsite hero when you share these accessories with family and friends. Cheers! Bring an air of sophistication with you to the campsite. This insulated wine tote and set of two nesting wine glasses is ideal for sipping 1970 Chateau Mouton Rothschild at the campfire. The reusable carafe is also perfect for Mad Dog 20/20, if that’s your thing. 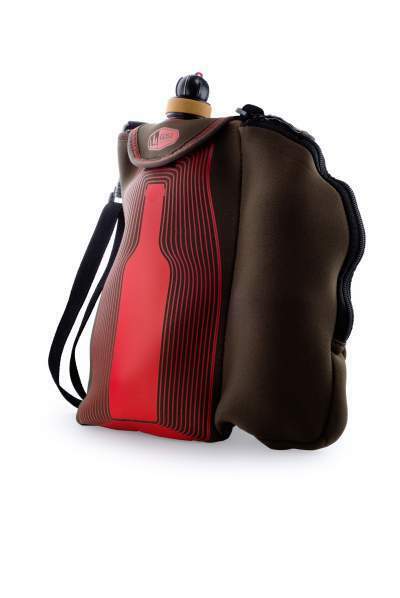 Neoprene top flap design holds the included 750ml Soft Sided Wine Carafe in place and allows for easy, unencumbered pouring. A stowable, secondary zippered pocket folds out from behind to hold the two wine glasses. The carafe’s two-stage cap and wide-mouth opening make filling the bag from a bottle easy, while the second, smaller opening makes dispensing the perfect pour simple and splash-free. The carafe includes a rewritable date bar on the reverse-side to record vintage and uncorking date, plus there’s a shoulder strap for convenient carrying. This vacuum-insulated 64oz growler and accompanying four-pack of stainless-steel tumblers goes well with all of our inventory. After all, we didn’t become the “Official Outfitter of Great Times” without having a lot of fun…and beer. 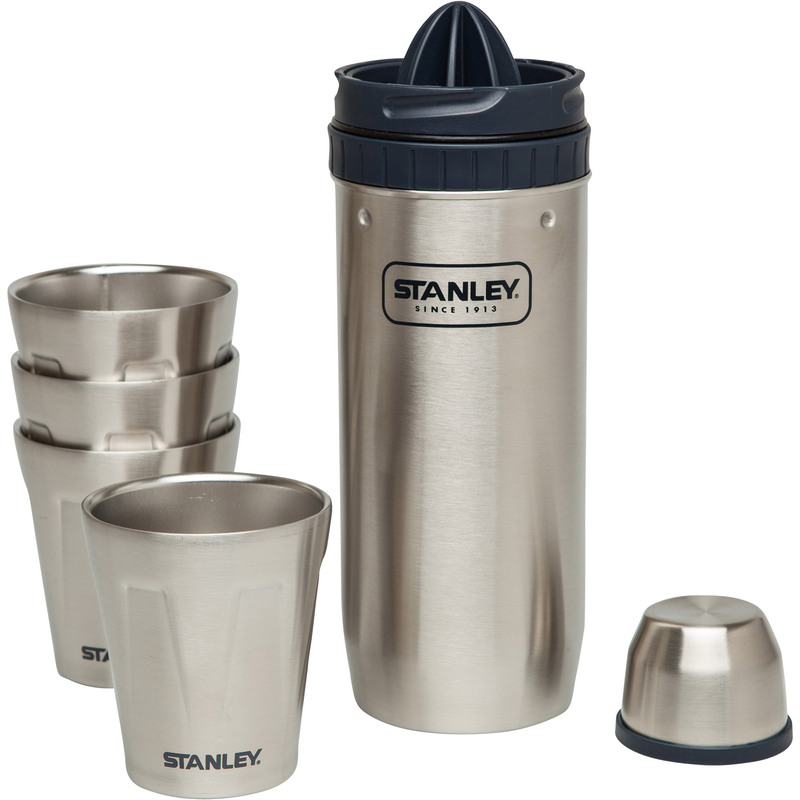 Stanley combines their iconic styling with bomb-proof construction, cold-trapping insulation and an easy poor lid with four packable tumblers destined to make you the campsite hero. Bring the party with you! 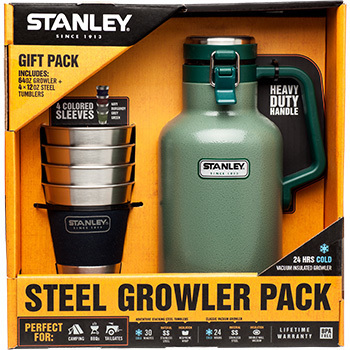 This Adventure Steel Shots and Flask set is everything you need for a great time in the outdoors. Pack your favorite booze in the flask and toast to another night under the stars with your friends. The set is dishwasher-safe. 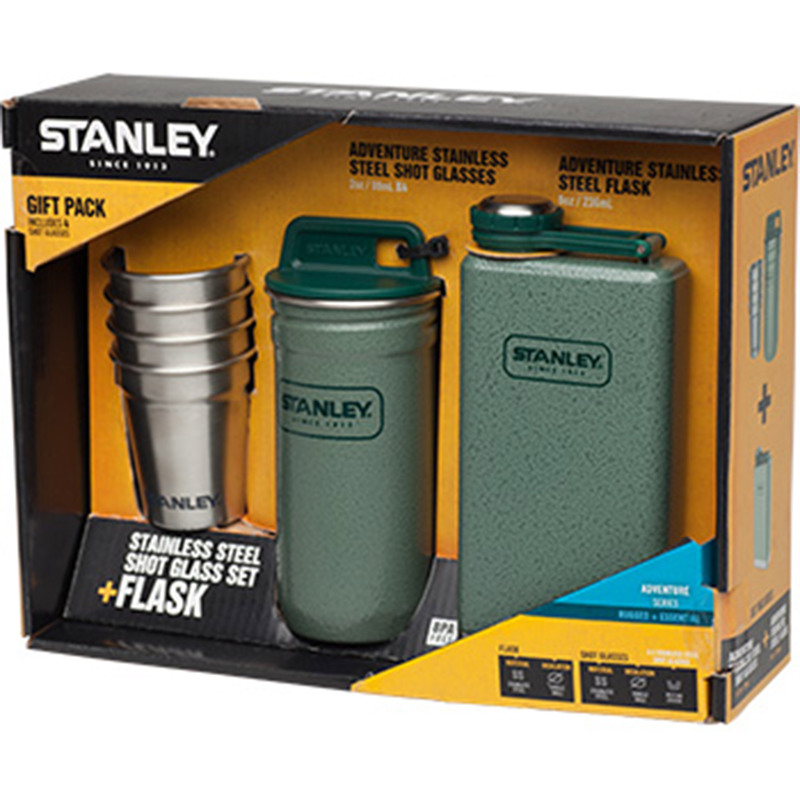 Just because you may be deep in the woods doesn’t mean you can’t enjoy a campfire cocktail or two or…Take along the amazingly awesome Stanley Adventure Happy Hour 4x System to add to your already great time. Whether it’s margaritas by the fire, a martini on the trail or a bloody before fishing, this do-it-all cocktail shaker has it all. You can use the removeable reamer to juice and strain directly into the jigger cap, rocks glasses or shaker. The set is dishwasher-safe. All seven pieces nest into a convenient take-along-anywhere set. The DrinkTanks 128oz Vacuum Insulated Growler is the biggest growler in the world. Able to preserve an entire gallon of beer, our 128oz growler is aptly named The Juggernaut for its astounding size and durability. Made with premium stainless-steel double-wall insulation, this thing is a tank and keeps your beer cold and fresh. It’s dishwasher safe, BPA-free, and leak-proof; what more can you ask for in a growler? On your next trip to the local brewery, this beast of a growler is sure to turn some heads. Easily turn The Juggernaut growler into a mini-keg with one of our Keg Caps for an effortless, pressurized pour no matter where you are. It’s the perfect mini keg for the craft beer lover. Now all you need is a Keg Cap! The DrinkTanks® 64oz Insulated Growler is our classic beer vessel, sporting double-wall insulation of durable 18/8 stainless-steel ensuring your beer stays as cold and as fresh as the moment you filled it. The 64oz growler cap seals vacuum-tight, preventing leaks and keeping your beer carbonated and tasting great wherever you go. The poly cap is secured by a leak-proof sturdy dual-bail cap system. Make DrinkTanks 64oz growler your new favorite item.